Providing you the best range of screw conveyors and belt conveyor with effective & timely delivery. The spiral blades are made of stainless steel and have a big strength and well resistant to corrosion. SFC screw conveyor, which is designed according to the standard of JB/T679-95 screw conveyor. The machine features high reliability, long lifetime, good applicability, convenience to install and maintain. The temperature of materials can reach up to 100 °C, the biggest dip angle can be up to 45°. The Screw Conveyor is a conveyor device, which utilizes the rotation of the helical axis in the U-groove to achieve the delivery of materials. Also, they can be used to density and convey substances in other fields such as wastewater sludge, coal, foodstuff, marl, flow-line production, and baggage to substitute manual carry. 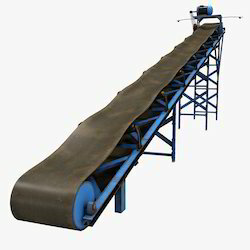 According to the requirements about conveyor, this conveyor can make horizontal or oblique transportation by itself or combine with other conveyors.There are no relative motions between materials and conveyor belt, the damage to materials can be avoided.Conveying is smooth and steady.Low energy consumption and cost for the conveyor. Driving arrangement of conveyor: Be made up of vibrating motor setting up on the base welded by shape section, rapid coupling, and reduced, retarded coupling. Rolling parts of conveyor: driving pulley and bend pulley. 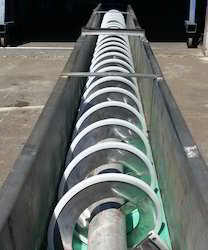 Clearing parts of conveyor: spring and non-loaded cleaner. Discharge parts of conveyor: fixed plow and electric discharge. The conveyor is used widely in metallurgy, mine, building, transportation, light & textile, hydropower and harbor industries and departments and used to convey scattered and block materials. Looking for Standard Conveyor ?